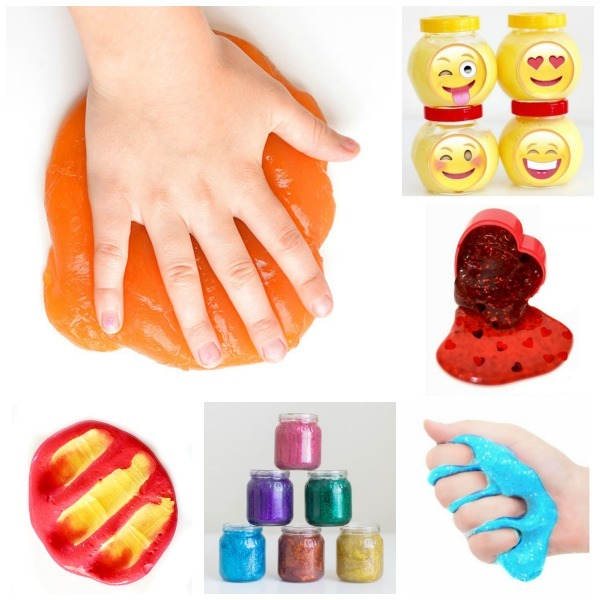 Today, we combined a few of our favorite things to make the most amazing play slime for kids! 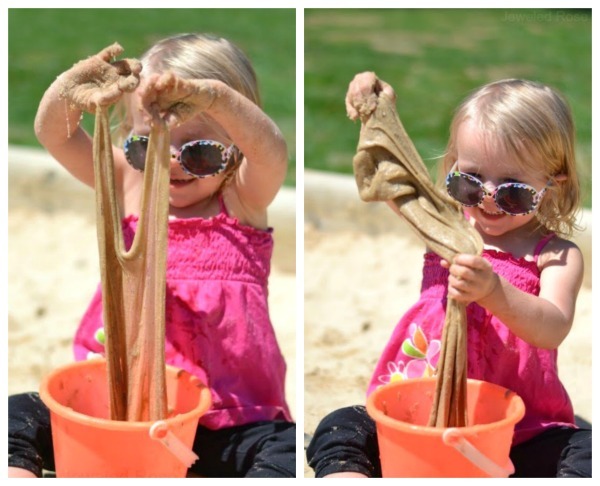 This slime is super stretchy, ultra Oozy, and it is made from sand! How cool is that? Read on for the easy recipe. 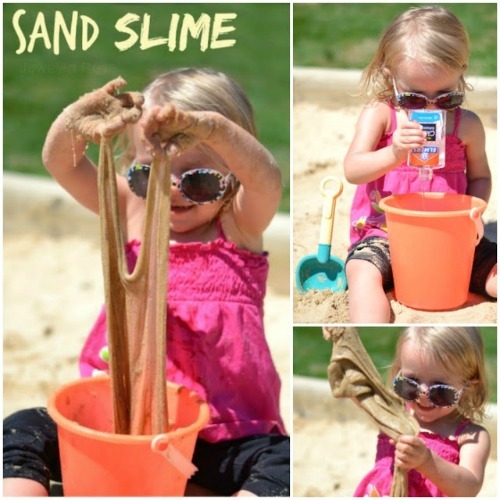 Given that you only need two ingredients plus sand to make this slime you can easily whip it up at the beach or right in the sandbox at home. 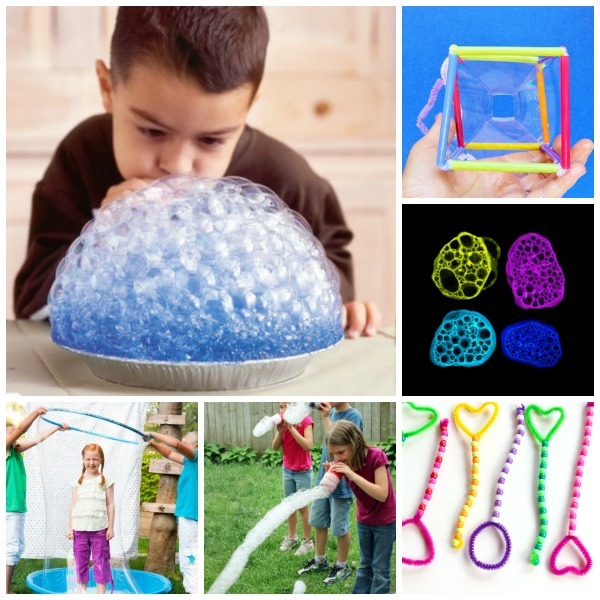 Are you ready to make sand slime? 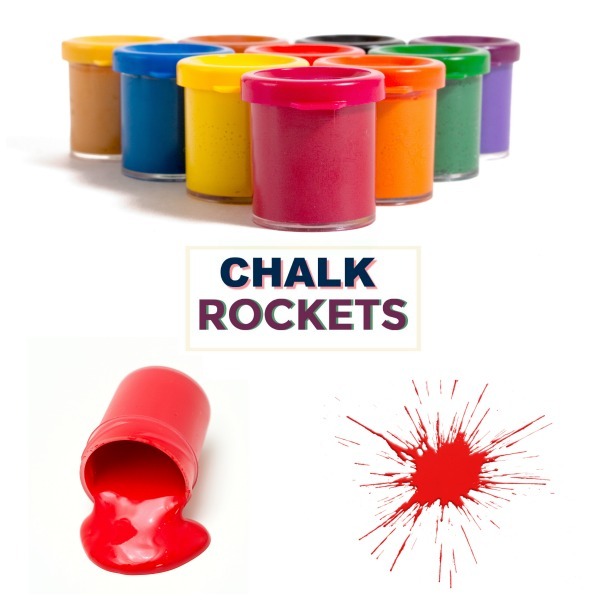 Note: You can use clear glue or white glue for this activity. Liquid starch can be hard to find in stores. We buy ours online here. 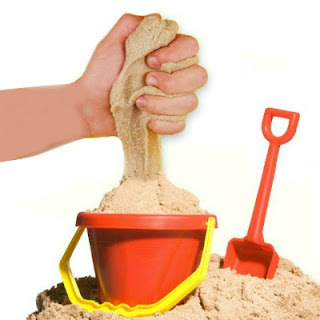 Begin by combining the sand and the glue in a sand bucket or bowl. Slowly begin to add liquid starch to the bucket, slowly adding more starch and mixing until the desired consistency is reached. 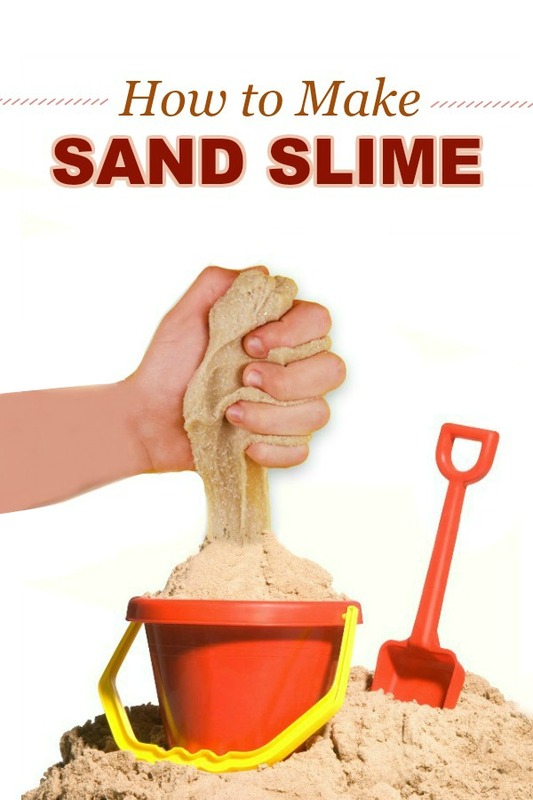 Once the slime is formed remove it from the bucket/bowl and knead it with clean, dry hands. At first the ingredients will be sticky and gooey, but after a bit of mixing the perfect, most glorious slime will form. Jewel had so much fun making oozing sand castles. 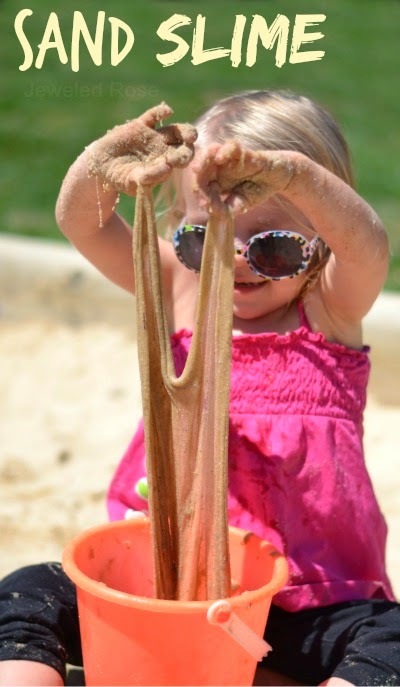 She also loved stretching and pulling the sand and watching it change forms in her hands. We will definitely be making this next time we go to the beach! 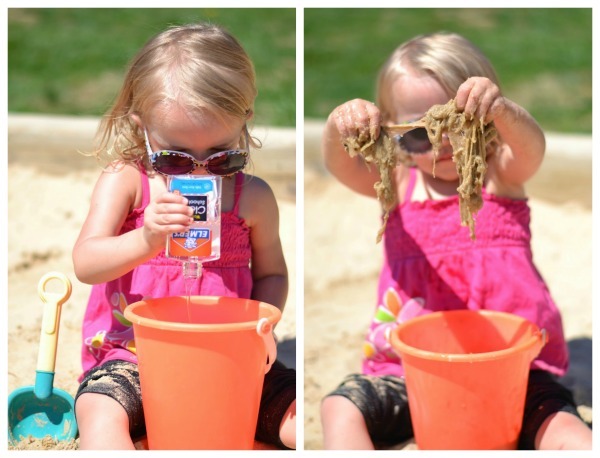 Jewel played with her sandy slime for a long time, and then we stored it away for another day. 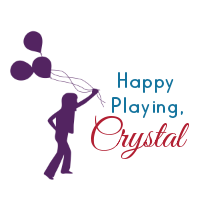 A Few Tips: I recommend having a water source nearby to wash kids hands after play. The hose works great, and if you are at the beach then you are all set! Store your sand slime in a zip-seal bag or air-tight container, and it can be used again & again. You can buy school glue in bulk online here. Liquid starch can be purchased online here.